Three years on from their number one album Cavalier Youth, You Me At Six are back with the follow-up they recorded with Kings Of Leon’s producer. We called frontman Josh Franceschi to talk recording Night People in Nashville, the need for stricter regulations around secondary ticketing services and the secret to longevity. First up, can we talk about your recent visit to Parliament to discuss secondary ticketing websites. How did you become involved? So, we recently put a show on sale in Camden. Within 10 or so minutes the show was sold out, which was obviously great but then we received feedback from our fans online that the tickets were already on these secondary ticketing websites at an inflated price. I was like, “Surely someone wants to do something about this?” and I realised that no-one did except for an MP called Nigel Adams. I got in contact with him through a mutual friend to discuss what we could do, and he told me he’d already set up a petition to ban the use of tout bots, which is this mechanic which swoops up tickets, sometimes before shows even go on sale. We got the petition to about 85,000 signatures but the media interest forced the select committee to discuss it in a broader sense. So basically, I went and sat in front of the select committee with the FanFair Alliance, and we gave our evidence and then StubHub and Ticketmaster gave theirs. After us there was a professor and a private investigator who had done their own studies into what’s been going on and it was pretty conclusive that something has to change, so we’ll see what comes of it. I’m hoping ticketing bots will be eradicated, but I think there’s going to be some investigating into these secondary websites – who’s behind them, who’s funding them – because it’s a £1 billion industry now. And ultimately they’re taking money out of the industry with no intention of putting it back in. You’re clearly very passionate about the subject. Yeah. There have always been touts outside of our shows, and at live concerts and sporting events all around the world. What really annoyed me was the extent to which it’s happening. Some of these ticketing websites own secondary ticketing websites, and they’re actually passing tickets on deliberately to make more money out of fans. And I think that I am worried about younger musicians too. I know how difficult it was for us when we started out 10 years ago, trying to get people to come to local shows, so I have no idea what it must be like now. I don’t even know if there are local music scenes that are thriving anymore, because all of the local venues that I played in, growing up, have been closed down, which is sad. There may not be a direct correlation but I think everybody has their limits; you can only rip off people for a certain amount of time until they switch off completely and they move onto something else, whether that be another band or an artist, or whether that be the notion of going to live shows in general. So I think we have a duty, not only to the fans but also to the next generation of musicians, to do something about this. I’ve had a 10-year career – which not many people are lucky enough to have in the music industry – so whilst I’ve got a platform and an opportunity to speak up for the people who’ve done so much for me and my friends, I’m going to do that. Towards the end of our petition we had the likes of One Direction and Mumford & Sons encouraging people to sign it, but otherwise I was very disappointed, actually, by the lack of engagement from other artists. I reached out to a lot of people but I think there’s an element of fear there, going up against the likes of StubHub and Ticketmaster, which are massive companies. But, ultimately, I felt that I would struggle with the guilt of doing nothing, versus the headache of doing something. Whilst I’ve got a platform and an opportunity to speak up for the people who’ve done so much for me and my friends, I’m going to do that. So tell us about what we can expect from the new material. We’ve been releasing new songs in dribs and drabs but ‘Swear’ is a fast, hard, energetic rock song – something that I think we’ve been trying to perfect for the last few albums, and hopefully getting better at. We’re all really excited about the album and we spent a long time making it. We got to go and record in Nashville, Tennessee, with Jacquire King, who’s a three-time Grammy Award-winning producer, so that was a nice little compliment that he was even remotely interested in making our record. Why did you choose to work with Jacquire King and what did he bring to your sound? Predominantly, we’ve worked with producers that have worked on other records by bands whose sounds and styles we’ve sort-of been emulating for the last few records. Jacquire has made great records with Kings of Leon, and James Bay and Norah Jones, but for us it’s a leftfield choice to go for a producer like that. To be honest, we wanted to approach him for the last album but we didn’t think he’d even return our phone call so we decided not to embarrass ourselves. We weren’t going to reach out to him this time either, but once we got on the phone with him we realised he’s been gagging to make a rock record for a few years now, especially since Only By The Night, and I think he was just waiting for the right band. And we loved the idea of recording our record live, in a big room altogether, and that’s what Blackbird Studios enables you to do. I think he definitely encouraged us to make our interpretation of rock music, rather than being focused on what was the sound of now, so to speak. And for me in particular, he really built up my confidence again because, although it was successful, the process of releasing and touring the last record just turned the lights off a little bit for me. He was a very good motivational speaker, sometimes without even saying too much. So you were burned out going into making this album? And you realised that this is what you want to do. Well, sometimes taking something away reveals what it really meant to you in the first place. 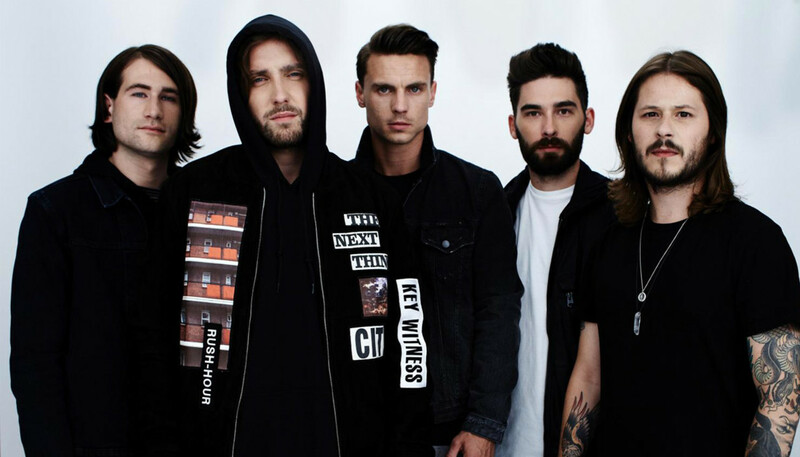 Not that the thought of walking away from You Me At Six necessarily ever crossed my mind, but it was more about, “Do I want to battle with the logistics and politics of being in the band anymore?” So we took some time out. I can’t remember how it happened, but I then just started picking up the guitar again, and then Dan – our drummer – built a studio at his house and we would spend three or four days a week there, mainly hanging out, and bit by bit the record came together. We read that you compiled a list of the band’s achievements before tackling this new album. There must have been a lot you’re proud of? Yeah. There was a lot of patting on the back, but also that was the foundation of the new record: looking at what we’ve done and understanding what that actually means, and how rare it is for bands from England to have the success we’ve had. The reason I think we all needed a bit of time – and we only took about six months off properly, if that – was just to look at and enjoy and appreciate our journey, because being a musician is a really cool rollercoaster to be on. I left college at 16 and fortunately I haven’t really had to look back. But did I ever think that our band would have had number one albums or would have headlined arenas or played the main stages of the biggest festivals in the world? Probably not. It’s important to value what you’ve done and know that it’s not something that happens to everybody. And now for us to better those achievements – or at least match them – we have to reach a certain level with our songwriting. So we used it as almost as a motivation and a benchmark for what we wanted to do. Ultimately, we did not want to put out a record until we believed we’d produced the best stuff we’ve ever done, so that’s why it took a bit longer than I think we’d intended it to, or perhaps longer than our fans would have liked. It’s been a three-year wait for them but I believe it’s worth it, so hopefully they’ll agree as well. And is there a bucket list for the next 10 years? Well, I used to measure our band’s success in milestones on a live scale, but I realised that one of our big achievements was to actually have been in a band for 10 years, and to have grown closer as a collective – that’s quite rare in itself. I don’t think there’s one band that we came up through the ranks with that either a) are still around or b) have the same line-up. Ultimately, longevity has always been our main incentive. I’d love to still be travelling the world and performing in another 10 years. I’d love to go to stadiums. I’d love to headline Reading and Leeds Festival at some point – I hope we get that phone call. But again, none of these things will come to us unless we work hard for them so I think that will be my main thing: making sure that we all stay focused and enjoy it. Because honestly when I think about the last 10 years now, the way they’ve just flown by is scary. I have no doubt I’ll be in a zimmer frame before I even know it.